meditation on the destructive power of war. In her experimental essay film The Last Happy Day, Lynne Sachs uses a variety of film types (super 8 home video, stock footage, still photographs), narrative content (interviews, letters, acted scenes) and other components to build her depiction of Sandor Lenard. A distant cousin of Sachs, Sandor was a medical doctor who worked for the U.S. Army Graves Registration Service, reconstructing skeletons out of the bones of dead American soldiers from World War II. After this position, he moved to Brazil where he lived reclusively and translated “Winnie the Pooh” into Latin. The concept of distance, made apparent by Sandor’s purposeful distancing from the realities of the Holocaust, is vital to the film. The various applications and iterations of distance shape the filmic language and afford the viewer an avenue of access to what the film says about war, the Holocaust, and how we see. The eye as a mediator is only able to focus on one thing at a time, with everything around that point of focus being lost to obscurity; this forces a piecemeal understanding of one’s environment. The filmic eye in The Last Happy Day, too, is an obscuring and complicating force, which helps to form the film’s language. Sachs manipulates her camera very deliberately, employing the difference between sharp-focus and soft-focus. Her camera is dizzying. It sees through things: focuses on one and alters its focus to another, all within the same line of sight. The constant focus adjustments during the scenes of “Winnie the Pooh” rehearsal create a distance between the viewer and the subject, one maintained by the filmmaker’s hand. The camera sometimes focuses on objects in the periphery instead of the person in the shot, such as the scene where the purple flowers and candles are clear, and clearly disabling focused sight of the scene’s human subjects. Sachs manipulates the fluidity of the focus, often shifted in a choppy, unnatural way, reminiscent of being submitted to a prescription exam at the eye doctor. This, coupled with the tendency of heavy background light to darken heavily the foreground, add to the camera’s role in distancing the viewer from the filmic subjects. Not only does Sachs’s particular camera technique create a distance within the film’s rhetoric, but Sandor’s intentional distancing from the war does so within the narrative. Sandor distances himself emotionally and physically from the war, but he also denies his distancing. 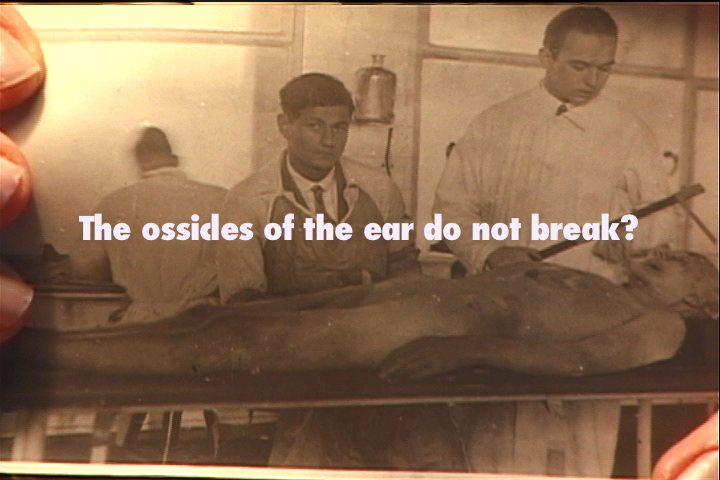 The film separates the viewer from the reality of the mass grave by including abstracted, duo-toned stock footage of war with Sandor’s words about the bones. These words, even, were in a letter to someone who is neither the director nor the viewer, and the voice is obviously not Sandor’s. These are two additional layers of distance between perceiving what is presented and attempting to understand it. Eventually, the film’s distancing procedures end up illuminating the narrative, perhaps more than if the story that develops through the experimental techniques was told in an actual narrative-style film. This is seen particularly strongly in the scene where the young girl who plays Christopher Robin is describing death after being introduced to the topic through Sandor’s Latin translation of “Winnie the Pooh.” His word choice was colored with sterile negativity, free of emotion and full of fact. It permitted the girl to explore and explain the concepts of depression, death, and the desire for death in a way that would perhaps be impossible without the mediating force of a dead language. The distancing tropes of film overall perform the same type action for the viewer, allowing access to understanding of the premise and the subjects that would have otherwise been impossible. The ongoing film series American Originals Now offers an opportunity for discussion with internationally recognized American filmmakers and a chance to share in their artistic practice through special screenings and conversations about their works in progress. Since the mid-1980s, Lynne Sachs has developed an impressive catalogue of essay films that draw on her interests in sound design, collage, and personal recollection. She investigates war-torn regions such as Israel, Bosnia, and Vietnam, always striving to work in the space between a community’s collective memory and her own subjective perceptions. 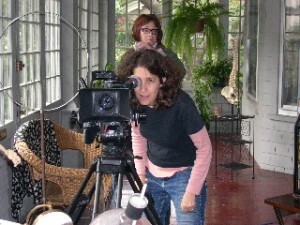 Sachs teaches experimental film and video at New York University and her films have screened at the Museum of Modern Art and the Buenos Aires, New York, and Sundance Film Festivals. Her work was recently the subject of a major retrospective at the San Francisco Cinemathèque. The National Gallery of Art and its Sculpture Garden are at all times free to the public. They are located on the National Mall between 3rd and 9th Streets at Constitution Avenue NW. For over seventy years, a steady stream of letters was exchanged between Alexander Lenard and members of my family in Memphis, Tennessee. Most of these reflections on everything from stock market prices to family trips, to the legacy of war to the cost of cranberry seeds, were exchanged between Sandor (he was called in the family by his Hungarian first name, without the accent) and my great-uncle William (a.k.a. Bill) Goodman. Luckily for me, my prescient uncle had a heart-felt, insightful appreciation for the epistolary vision he saw in his cousin Sandor’s missives. He kept every letter that he received from Lenard, as well as copies of his own correspondence. In the mid-1980s, I became fascinated with Alexander Lenard’s story, wondering to what extent it could give me insight into our family’s heritage in Europe before and after the horrors of WWII. Aunt Hallie Goodman, Uncle Bill’s wife, and later Eleanor, their daughter, knew that I had chosen filmmaking as my life’s work. They appreciated my curiosity about and commitment to Sandor’s story and eventually offered me the entire archive to fathom what I could of this rich and troubling tale of hardship and survival. In 2009, I completed The Last Happy Day, an experimental documentary film inspired by the life of my distant cousin. By interweaving excerpts from these letters into the visual and aural fabric of my film, I embrace the whimsy and the pathos that was Sandor Lenard. Always an exile, a victim of a kind of human “continental drift”, my cousin never felt “at home” in the synthesized post-war euro-culture he found in Brazil. Building a harpsichord on which to play Bach, reading thirteen languages and translating Winnie the Pooh into Latin allowed him to stay connected to an old-world life to which he would never return. The two decades I spent researching, traveling, shooting and editing my movie allowed me to explore the implicit paradoxes of a life both thwarted and nourished by the contradictions of a troubled time. Interestingly enough, the Lenards were the only branch of our extended family that remained in Europe during World War II. In 2003, I travelled to Düsseldorf, Germany to meet Sandor’s son, Hansgerd Lenard, then in his late sixties. As I stood with my camera, he uncovered a trove of family diaries, letters and inscribed books from the 1920’s and 30’s. Inside each book, Sandor and his parents had meticulously transformed their obviously Jewish surname LEVY to a more Hungarian LENARD. Rather than destroying this direct reference to their hidden family identity, Sandor’s family, my sole remaining European relatives, meticulously erased. In their minds, the key to survival in early twentieth century Hungary would be pristine assimilation. June 17, 1920, Dear Eugene: Our oldest son, William will graduate tomorrow at the University of Pennsylvania, the second is in military camp in Kentucky, the third is too small and is at home. Acting on your suggestion I am herewith enclosing you New York Exchange for $1,000.00 which from the figures that you gave me in your letter you can use to a very much better advantage in Budapest, than having this amount converted into Kronen in this country. I am sending this to you to use or invest, returnable in two or three years without interest. For the next 28 years, there did not appear to be a great deal of cross-Atlantic letter writing between the families, not until the end of World War II when William Goodman, now a successful Memphis attorney with four children, traveled with his wife Hallie to Rome where he made some remarkable discoveries about his cousin. During World War II, Sandor , a struggling doctor with Jewish lineage, had found refuge in Rome and had devised his own unique way to survive the traumatic world of occupied Italy. By 1948 he worked for the United States Army’s Graves Registration Service reconstructing the bodies of American soldiers killed in combat. In a letter dated September 26, 1948, William and Hallie Goodman have just met Lenard for the first time. Together, they write to William’s mother Bobye Wolf who was directly related to the Lenard family through her mother Wilhelmina Levy, born in Worms, Germany in 1840. Here you will see Hallie refer to Lenard’s first son whom Lenard left in Germany with his German, Aryan, mother. She also refers to Lenarad’s second, Italian wife, Andrietta. (Hallie) We went to Alexander’s home to see him, his wife and child. He’s a very intelligent man, but I am afraid not too practical. He doesn’t seem very anxious to come to the US even though they are destitute, and can barely manage to get along. Bill gave him a suit of clothes, and we took his wife Andrietta all our extra soap, a few pairs of hose, and a five-pound box of candy. Lenard says his son, Hansgerd, is almost starving in Germany and we promised to ask you to continue sending him boxes. 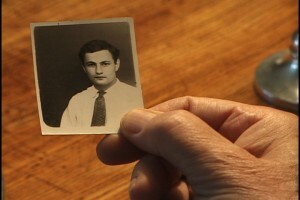 While making my films, I travelled to Sao Paolo, Brazil to film Sandor’s eighty-five-year-old wife, Andrietta. She described in vivid, almost dreamy, detail her husband’s macabre, medical work. I listened to her recounting his daily contact with the detritus of war, wondering to myself why we so rarely think about who is responsible for “cleaning up” the dead. In The Last Happy Day her graphic, realistic recollections stir visual ruminations on her husband’s futile act of posthumous, cosmetic surgery. March 25, 1950. Dear Cousin Bill, My conscience is the worst: I have still not completed the research (on our family), which is after all even more interesting for myself than for you… The fact is that after four years as a civil employee of the US Army I had to build a new base for my existence in medical writing. I wrote and published a book on children’s diseases and started one on painless childbirth. ….It’s the depressing present that renders looking into the past such a sorrowful undertaking. One hoped during the war that there would be a better world. It is hard to realize that the victims died so uselessly. Race hatred not only survived, but also came out stronger than ever. Europe and the world found a new and holy pretext for hate. I really hope that I am mistaken when I think the United States is becoming a dangerous place to live. Soon afterward, Sandor left for South America, never to return to the Europe that had so fed his imagination and his mind. In my film, I contrast the haunting confinement and violence Sandor experienced in Rome during the Nazi occupation with the verdant emptiness of his later life in remotest Brazil. I juxtapose Sandor’s fearless introspection in his unpublished letters with my imagined visualization of his idyllic life in his house in the woods. The geography of his NOW simultaneously saddens and protects him from the threats he fears are still percolating on the other side of the Atlantic. Correspondence with my family does not resume again until a decade later in 1961, when Lenard publishes Winnie Ille Pu, his Latin translation of Winnie the Pooh, and enjoys surprising worldwide success. Goodman gets word of the publication and brazenly takes things into his own hands by writing this Feb. 6, 1961 letter to the Editor of Time Magazine in the Time and Life Building in New York City. Clearly, Goodman sees the story of his cousin as an intriguing mix of quixotic impulses and stubborn intellectualism. In the spring of 1961, the two cousins finally make contact once again. Sandor writes a letter to Memphis, explaining his disappearance and his unexpected literary glory. Clearly, Lenard does not yet know that Goodman is not only well aware of his cousin’s publication but may also be responsible for the press coverage. Thrilled by his rejuvenated contact with his Hungarian distant cousin relocated to the forests of Brazil, my Uncle Bill responds immediately and practically to Sandor’s concerns about money. In addition, he describes his travels to Berlin, Moscow, Leningrad, Helsinki, Amsterdam, London and Paris with the family, giving Sandor a window into a wealthy American’s “if it’s Tuesday, it must be Moscow” itinerary. Dear William, Traveling is wonderful if you do it in a voluntary basis. After having been shoved around half the globe, I got allergic to the outdoors. I think a travel agent would have an easier time selling a round trip of the Mediterranean to Odysseus himself than to me. The less I move from my hideout 80 miles inland from Blumenau (the nearest village) in the greenest most peaceful valley in the world, the more I enjoy letters which have traveled a long way. Winnie Ille Pu has brought me in contact with Latinists the world over. I certainly never thought my Bear would reach the best-seller list, where he now enjoys his life for the 12th week running. I still have not received a cent from my publisher. Should I really receive royalties some day, I am going to become a sort of millionaire – or at least return to the middle class our family left in 1938. In 23 years of existence as a “have-not”, I am ready to accept it for the rest of my life. Because William is an attorney and is able to arrange the legal matters pertaining to Sandor’s royalties for his book, his next letter dated June 7, 1961 arrives with exactly the news Sandor wants to hear. Sandor’s subsequent July 12, 1961 letter, which is included here in its entirety, is a profound meditation on civilization and the ways Sandor has come to understand and perhaps reject it. In the letter he speaks about the joy of living amongst the flora, and his love of cranberries in particular. I remember hearing my Aunt Hallie’s stories about putting packages of these seeds inside a roll of newspaper and sending it off to our distant cousin in the southern hemisphere. How charming and eccentric we all thought this was, at the time, not yet having a sense of our distant cousin’s longings. The early 1960s mark a time in the cousins’ correspondence in which letters seem to flow almost monthly. Sandor finally receives a check for $8000 and claims that he could now be the richest man in the valley, except for the fact that he cannot cash the check. By 1962, life is good for Sandor, his wife and his second son Giovanni. Sandor comes to live with my Uncle William’s family in Memphis for a few months in 1968, a time of palpable racial tension, street protests and nightly curfew, the same year Martin Luther King was assassinated in a small motel in our downtown. Upon his return to his cabin in Santa Catarina, he begins a correspondence with my cousin Eleanor, Uncle William’s daughter, then a senior in high school. His November 27, 1969 letter to Eleanor (here in its entirety) is an eloquent homage to youth, wonder and discovery. In 1970, Sandor sends his own teenage son Giovanni to live for a few months with their American relatives in Memphis. Giovanni returns to Brazil relating that William’s own adult children have each begun families in homes near that of their parents. To Eleanor, he writes another letter, offering a frank description of his own health. On September 25, 1970, Sandor’s own doctor writes a personal letter to the family, stating that for the past few months Sandor’s working capacity has declined, and that he has lost his drive to write, study or read. Soon afterward, he writes his own obituary and dies. is a filmmaker making experimental documentary films since the mid-1980s. In the The Last Happy Day she constructed a narrative triangle between Lenard, her Uncle William and herself. While their presence in the film is grounded in a dialogue from the past, her participation is more temporally and geographically fluid, creating an evolving relationship of distance and intimacy through voice and text. The film (available from the New York Film-makers Cooperative at www.film-makerscoop.com) premiered at the New York Film Festival and was shown by Duna Television on March 16, 2010, the 100th anniversary of Lenard’s birth. “In 2009, I completed The Last Happy Day, a film that uses both real and imagined stories about Sandor Lenard, a distant cousin of mine and a Hungarian medical doctor. (See text above for description). Several years ago I traveled to Sao Paolo, Brazil to film Sandor’s eighty-five year old wife, Andrietta. She described in vivid, almost dreamy, detail her husband’s macabre work. I listened to her recount his daily contact with the detritus of war, wondering to myself why we so rarely think about who is responsible for “cleaning up” the dead. Later in the film, Andrietta’s graphic, realistic recollections stir visual ruminations on this futile act of posthumous, cosmetic surgery. “In my previous films, the elusiveness of the biographical impulse pushed me to interweave home-movies, found footage, interviews, and actual letters as a way of exploring the intricacies of my subjects’ lives. Stylistically, I developed a discursive way of working that integrated authentic materials with more artificial, constructed visuals. With The Last Happy Day, I constructed a narrative triangle between Sandor, my Uncle William and myself. While their presence in the film is grounded in a dialogue from the past, my participation is more temporally and geographically fluid, creating an evolving relationship of distance and intimacy through voice and text. “Early in the film, I jump right into a reverie that introduces Sandor’s strange understanding of the human body—in death and in life. Through an evolving, highly saturated visual language, I contrast the haunting confinement and violence Sandor experienced in Rome during the Nazi occupation with the verdant emptiness of his later life in remotest Brazil. I juxtapose Sandor’s fearless introspection in his unpublished letters with my imagined visualization of his idyllic life in his house in the woods. The geography of his NOW simultaneously saddens and protects him from the threats he fears are still percolating on the other side of the Atlantic. As a way of articulating his longings, I project images from Roberto Rossellini’s hauntingly sad feature film Rome, Open City onto an array of reflective surfaces in Sandor’s vine-covered house in the woods of Brazil. “Always an exile, a victim of a kind of human ‘continental drift,’ Sandor never felt ‘at home’ in the synthesized post-war euro-culture he found in Brazil. Building a harpsichord on which to play Bach, reading thirteen languages and translating Winnie the Pooh into Latin allowed him to stay connected to an old-world life to which he would never return. Through the visual texture of this film, I use images of landscapes as proscenium, and even as character. The camera searches for familiar terrain, names, and identifiable landmarks: zones of danger, safety, comfort and despair. “In all honesty, I’ve wanted to make a film about my distant cousin Sandor for over twenty years. His was the only branch of my family that remained in Europe during World War II. During the production, I traveled to Dusseldorf, Germany to meet Sandor’s son, Hansgerd, now in his late sixties. As I stood with my camera, he uncovered a trove of family diaries, letters and inscribed books from the 1920’s and 30’s. Inside each book, Sandor and his parents had meticulously transformed their obviously Jewish name “Levy” to a more Hungarian “Lenard”. Rather than destroying this direct reference to their hidden family identity, Sandor’s family, my sole remaining European relatives, meticulously erased. In their minds, the key to survival in early twentieth century Hungary would be pristine assimilation. My own southern Jewish family in Memphis also refused to grasp fully the catastrophe that was Europe. With far less to lose, their methods of confronting eminent danger were similarly subtle. Keeping this legacy of detachment in mind, I try to create narrative distinctions between close and remote experiences of war. As Sandor’s world fell into a state of hunger and decay, he delighted in the absurd and the arcane. Humor was his life raft, his potent means of resistance. Speaking, reading and writing Latin kept him from what Natalia Ginzburg, another writer trapped in Occupied Italy, called ‘the fury of the waters and the corrosion of his time.’ Through images and writing, implicit connections to our own wartime situation push their way into the fabric of the film. The Last Happy Day is an experimental documentary portrait of Sandor (Alexander) Lenard, a Hungarian medical doctor and a distant cousin of filmmaker Lynne Sachs. In 1938 Lenard, a writer with a Jewish background, fled the Nazis to a safe haven in Rome. Shortly thereafter, the U.S. Army Graves Registration Service hired Lenard to reconstruct the bones — small and large — of dead American soldiers. Eventually he found himself in remotest Brazil where he embarked on the translation of “Winnie the Pooh” into Latin, an eccentric task that catapulted him to brief world-wide fame. Sachs’ essay film uses personal letters, abstracted war imagery, home movies, interviews, and a children’s performance to create an intimate meditation on the destructive power of war. Broadcast: Hungarian Public Television, Spring 2010. Selected Screenings and Honors: Indiewire.Com: Nominated One of the Best “Undistributed Films” of 2009 (Phillip Lopate); Director’s Choice Award, Black Maria Film Festival 2010; San Francisco Cinematheque; Pacific Film Archive; Punto de Vista Documentary Film Festival, Spain; University of Chicago; Chicago Filmmakers; Closing Night Film Singapore Film Festival; International House University of Pennsylvania.